Transform your photography with the Modern Film Collection for Lightroom and Photoshop. Whether you want to emulate Old or New Hollywood, this Collection makes it possible! Add film-inspired colors, perfect light enhancement, or smoothing skin tones using this collection of comprehensive presets and actions. From the delicate pastels of popular wedding photography to deep cinematic colors, these presets are created to give your pictures a polished look all on their own. You can create film-worthy images while you streamline your workflow and produce stunning results. The Modern Film Collection comes with Lightroom presets, Photoshop actions, and Camera RAW presets allowing you to add custom-finishes to your images with just one click. 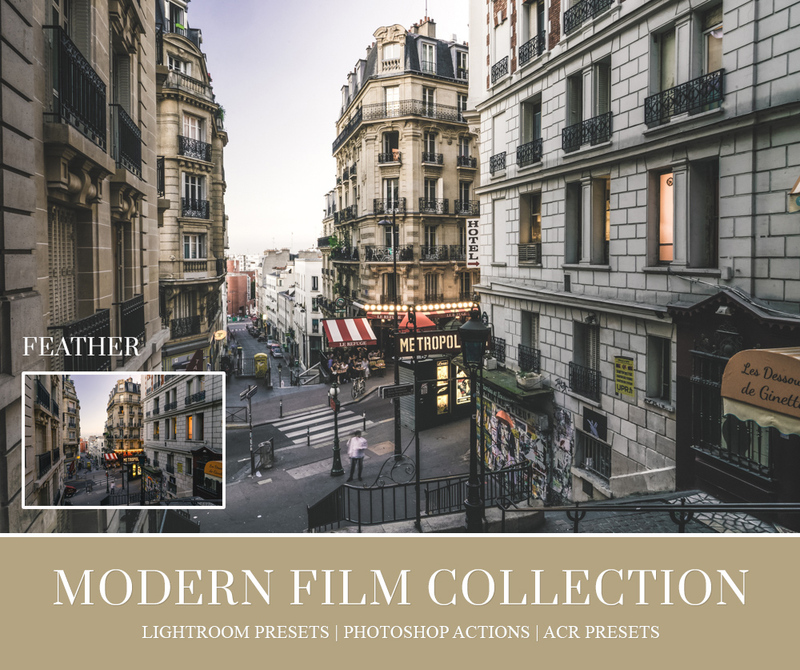 Modern Film Collection for Lightroom and Photoshop is a well-balanced pack that provides a well-adjusted range of distinct looks, from contemporary to vintage, vigorous to minimal, and everything in between, which alter grain, richness, and contrast. Carefully designed to be subtle yet effective on every image they are applied to, this collection is perfect for outdoor and lifestyle photography, for portrait and wedding photography, street, nature, landscape, and fashion images. The Modern Film Collection for Lightroom and Photoshop comes with everything you need to produce a broad range of distinctive looks. Whether you want contemporary or vintage, intense or minimalistic, or anything in between, with this Collection, you will be able to alter grain, richness, contrast, and a lot more. It was carefully designed to allow you the ability to reproduce the distinctive qualities so typical of cinematic photography. You make subtle or bold adjustments; either way, we make it possible and easy for you to make changes to every image. This Collection is perfect for any number of photography styles including outdoor, lifestyle, portrait, wedding, street, nature, landscape, and fashion images. If you admire cinematic photography and want to recreate its stunning imagery, this Collection will help you achieve those results. When you need to enhance your images, the presets and actions of the Modern Film Collection will get you there. The excitement of cinematic photography, including Old Hollywood, comes alive using these carefully designed presets. Add depth, drama, and beauty as well as balanced light, contrast, and saturation. You can add any or all of these using our Collection. Rather than spend hours in post-production making adjustments or edits, our Collection makes it possible for you to streamline your workflow to a few easy clicks. You can apply your changes to one image or multiple. You can create a cohesive look for any collection of photographs using these presets. You also can create a signature look to build a “brand, ” or you can just make changes as you see fit. The Modern Film Collection of efficient presets and actions quickly becomes indispensable to photographers seeking to enhance the look of their work. All of the presets are there to make your life easier while making your photography better and your workflows faster. You don't need to waste time doing manual adjustments and edits; the Collection automates your workflow for you. Few photographers can afford to spend hours in post-production editing - sometimes fruitlessly as they pursue an effect that they can’t achieve. Our expertly-designed Photoshop Actions for the Modern Film Collection can transform both your workflow and the look of your work whether you are an amateur or professional. Achieve the effects you want without the headaches and hours in post-production. These Photoshop actions allow you to create and apply desired effects and save them for future use. We have made them easy to install with our step by step instructions. With the growing popularity of increasingly artistic photography, you could spend hours trying to achieve those qualities. However, our Camera RAW Presets make it easy for you to deliver cinematic photography-style pictures without a significant investment of your time. It doesn't take much time or effort - and there’s no guessing - with these powerful Camera RAW presets. Our professional designers and photographers have created these presets so that in several easy clicks, you can transform your images one at a time or in batches. Extraordinary photography is within your easy reach through our automated workflow presets. Remarkable photos are usually the result of post-production editing rather than perfection while shooting. Digital photography allows photographers to make the necessary enhancements or edits using sophisticated software, including our powerful Lightroom presets and Photoshop actions. At BeArt-Presets, we take software enhancements to a new level of efficiency and excellence. We realize that many photographers rely on photography for their livelihood. They just can’t afford to spend hours editing each image. You no longer have to spend hours thanks to our various collections, including the Modern Film collection. We have done the advance design work so that using these tools you can easily recreate elements typical of cinematic photography. Our presets and tools allow you to mimic the poignancy and drama associated with Hollywood imagery in your photography. Elevate your art to previously unimaginable heights with our Modern Film Collection of powerful presets and actions.